For the past few weeks, I’ve been bombarded with emails about the perfect whisky to give your dad this Father’s Day. 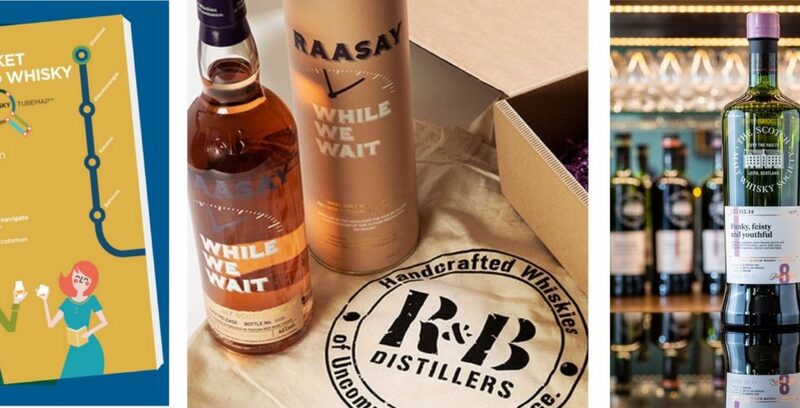 To be honest, there’s hardly anything unique about most of these whiskies, with the basic presumption that dads like whisky, so you can give them any old bottle on Father’s Day. So instead, here’s a round-up of the best whisky gifts to give that special man in your life (or your dad this Father’s Day. (All gifts are suitable for Scotch drinking mums too). If your dad wants to get into whisky, then look no further than The Pocket Guide to Whisky & Whisky Tube Map from Blair Bowman and Nicki Welch. The book is the perfect introduction for anyone that wants to get into whisky, which will have him progressing from novice to expert in no time. You can find out more on what I thought about the book here. Independent bottler The Scotch Malt Whisky Society has a special offer just for Father’s Day – a bottle of ‘Funky, Feisty and Youthful’, along with membership of the Society, for just £80. There’s just 270 bottles of the eight year old Highland whisky available, with the Society membership opening up a whole world of unique malts. Does your dad always stick to the same whisky? Then why not introduce him to new drams from Scotland, the USA, Ireland, Sweden and Japan, with the help of Master of Malt. Their Drinks by the Dram gift set is offering 10 x 3cl samples for under £60, which will hopefully give you dad a taste for something completely different. This Friday, Saturday and Sunday, the five-star Scotch Whisky Experience is offering a three-course set menu, with an engraved Glencairn whisky glass to remember the day. Dessert comes with a matched dram but then you can let him loose on over 440 different bottles behind their bar. If you REALLY want to push the boat out, then why not make your dad a founding member of the new R&B Distllery on the Isle of Raasay. For the princely sum of just £1999, the Na Tùsairean Whisky Club includes one night accommodation per year, whisky from the first 100 casks and a whole host of other drinkable goodies! And if none of these whisky gifts seems quite right, then a bottle of his favourite whisky will do. Don’t know what it is? Then just do a bit of research – root around in his cupboard, drop some subtle hints. Just be sure to join him in a dram when he cracks the bottle open.